American composer Frances White (b. 1960) was inspired by nature and her surroundings in her latest release, Centre Bridge: Electroacoustic Works, which features sounds native to central New Jersey. This disc contains a collection of five compositions, two of which are directly inspired by New Jersey’s Centre Bridge, and the remaining three incorporating sounds reminiscent of water surrounding the bridge. Ms. White’s music focuses primarily on deep listening whereby the listener encounters sonic environments that emphasize the small sounds in nature, immersing them fully into the world around them. What makes this collection of works even more compelling is her effective use of live instruments with electronic sounds. In the opening track, Like the lily (1999), the viola and double bass, played by Liuh-Wen Ting and Troy Rinker Jr. respectively, are featured amongst a wash of electronic sounds that compliment the instrumental sounds superbly. It is a very peaceful yet dramatic composition with lyrical melodies that emerge, at times hauntingly flowing in and out of a subtle electronic soundscape. This 14-min work was commissioned by the Institut International de Musique Electroacoustique de Bourges (IMEB), and is an excellent introduction to Ms. White’s compositions as it captivates the listener from the first moments of sound and invites them to continue on a musical exploration of her soundworld. Centre Bridge (1999) is written for the unique blend of electronic sounds and shakuhachi duo, preformed by Elizabeth Brown. An excellent pairing of live breath-like sounds that naturally decay, giving way to loon-like callings, allows for a wealth of ambient sounds to emerge. The spatial effects are very noticeable in this work as well, with the placement of sounds in both the foreground and background. Short bursts of the shakuhachi are then embellished electronically, as if transformed into another time and space. The electronic sounds slowly emerge in a very resonant drone. Emerging from the growling electronic sounds comes the melodic shakuhachi duo with a bird-like calling conversation leading into a soothing gesture of sounds. Centre Bridge has a storytelling quality taken from the perspective of travelers exchanging conversations with one another while on route from one place to another, then fading away to silence as if waking from a dream or a journey. A veil barely seen (2000) features the musical talents of Liuh-Wen Ting on viola, who also commissioned the work as part of five new works based on the Chinese elements (wood, fire, earth, metal, and water). It is a well-titled work as it begins as if from a whisper, with electronic sounds barely heard, followed by live solo viola. Ms. White has again given the acoustic instrument remarkably peacefully lyrical melodic lines that I found to be reminiscent of Ralph Vaughan Williams’ The Lark Ascending. Slowly, over the duration of work, the role of stream sounds shift quite dramatically in both the changing pitch and rhythm emulating the constant changes in the direction of the flow, from a small trickle to a roaring brook. The water sounds once again fade into the background, but remain a very integral part of the accompaniment. In the liner notes, the phrase “a veil barely seen” in the Tao Te Ching, refers to the eternal, primal female spirit associated with water, who is a gateway to the root of heaven and earth. The work ends as it began, fading away as like a stream running through silent woods. Walk through “Resonant landscape” No. 2 (1992) is the sole track on the recording featuring purely electronic sounds. The composition is dedicated to Edwin E. Pritchett and features a variety of wildlife recordings, including bird calls and flocks of geese, and water sounds, all juxtaposed with gently shimmering electronic soundscapes. Walk through “Resonant landscape” No. 2 was derived from Ms. White’s earlier composition Resonant landscape (1990), originally created at the Winham Computer Music Laboratory of Princeton University. This work has been featured as one of the soundtracks of Gus Van Sant’s new film Milk, starring Sean Penn, as well as his earlier award-winning films Paranoid Park and Elephant. This composition effectively creates a vibrant aural canvas that immerses the listener in the real surroundings from which these sounds originated. The final track of this CD is Centre Bridge (dark river) (2001). This electroacoustic composition for string quintet and electronic sounds was commissioned by the New Jersey Symphony Orchestra. Performers on this recording are: Pauline Kim (first violin), Airi Yoshioka (second violin), David Cerutti (viola), Susannah Chapman (cello), Troy Rinker Jr. (double bass), and featuring Paul Hostetter as conductor. This work again was inspired by Centre Bridge, and tries to capture its nondescript existence. According to the liner notes, Centre Bridge does not hold any structural or historical significance, however it is the timber-plank walkway, metal grate roadway, and sounds of the travelers that Ms. White had been inspired to depict in such an effective presentation. 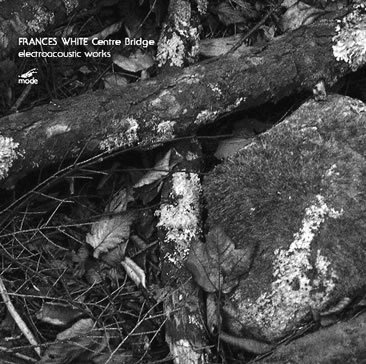 Francis White’s Centre Bridge is a well-presented collection of compositions as each work can stand on its own while at the same time complimenting the other recordings featured. Ms. White uses recording samples taken directly from nature itself as a starting point of her compositions, and the computer allows her to build on these sounds to create her own musical voice. In the liner notes, James Pritchett describes her compositional style best, stating that Ms. White “works as painstakingly as a painter who creates her own pigments.” I would have to agree that in this collection of works, Francis White’s palette of sounds displayed are engaging and complimentary to one another, similar to well-written works of literature. Overall, Centre Bridge is a satisfying disc to listen to and a magnificent accomplishment.